This is a story about growing up, discovering your self-worth, and learning how to navigate complicated relationship. 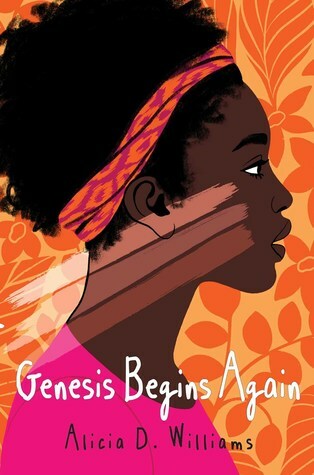 Genesis Begins Again is one of the best middle grade novels that I have ever read. I appreciated the fact that Williams did not hold back simply because she was writing a middle-grade novel. I want to put it in the hands of everyone of any age. I think a lot of young girls will really relate to Genesis’ story and her struggle to fit in when her complexion makes her stand out. Genesis also faces struggles that other young readers may also be experiencing including having a parent who is an alcoholic, living in poverty, and having to constantly change schools and start over. I instantly felt a connection to Genesis, and actually found myself getting protective of her. I cried along with her and I cheered her on. It breaks my heart to know that there are real girls going through the same things as Genesis. I hope that this book finds its way into their hands and it gives them some hope. I will personally be purchasing a few copies to donate to my local library. That is how important I think this book is! I am in awe of Williams ability to write raw and honest characters, and I can not believe that Genesis Begins Again is her debut novel. I am anxiously awaiting to see what she comes out with next! Genesis Begins Again is coming out on January, 15th! Thank you Simon and Schuster Canada for sending me an ARC in exchange for an honest review. This book seems heartbreaking, but at the same time so relatable, I might have to add this to my TBR. It really is, but it’s hopeful too! Wow. This one sounds so powerful! I may have to give it a read! Great review! Thank you. It’s a great one! I really think you will love it. It’s a powerful read!